I am always trying out natural air freshener ideas to figure out how to make home smell good. Who doesn’t like an amazing smelling home?! With a dog and two cats, I’ve never been a big fan of essential oil diffusers, so I’ve played with a lot of natural ways to freshen up the home. Even though there are pet-friendly essential oils that I use to clean around the house, I always make sure to dilute them well and completely wipe down surfaces to ensure the safety of my pets. With a diffuser, I worry that maybe my cat will fall asleep near the diffuser, wake up, and start cleaning himself. If enough oils had accumulated onto his fur during that time, consuming it could potentially be toxic. Not something I’m going to risk! Whether you’re covering up the smell of a cat’s litter box, the musty scent of living with a teenage boy, or a particularly flatulent spouse, here are some zero waste air freshener ideas for how to make home smell good without essential oils. How to Make Home Smell Good Without Essential Oils With These Zero Waste Air Freshener Ideas! I don’t think I can start this list with anything other than fresh air. If possible and effective, this should be your first course of action. No better way to have natural air than to let in natural air. Opening a window can breathe a whole new life into your home. The breeze coming through the window will blow away the smells and bring you fresh oxygen and clean air. Don’t be afraid to crack open the window during the winter, too. A lot of people (understandably) worry about wasting heat, but for your health, you should consider doing so for at least 10-15 minutes daily. Indoor air is significantly more polluted than outdoor air (think VOCs, mold, dust, and bacteria). By allowing this natural ventilation, you can breathe healthier and feel like you have a fresh, new home. I don’t drink coffee, but I love the smell of freshly roasted beans. I love passing by cafes and just taking a deep breath – inhaling the lovely scent. It refreshes my mind and makes me feel like I’ve inhaled caffeine and am ready to take on the day. I’m a bit strange. If you’re like me and appreciate the smell of coffee, you’ll love this natural air freshener idea! All you need is a tea light, some coffee beans, and a small container. Fill a small, cute, glass container with coffee beans. Squish a small tea candle into the middle and light up the candle. The coffee beans themselves will exude a small scent, but combined with the minimal heat from the tea light, will exaggerate this lovely smell throughout your room. I like to light up my candle for half an hour in the morning as I read a book or listen to an audiobook during breakfast. 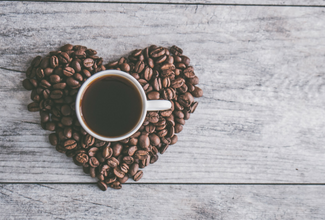 A 2008 study out of South Korea found that the aroma of roasted coffee beans had antioxidant and stress relaxation effects on sleep-deprived rats – so perhaps I’m not crazy after all! A home with the smell of freshly baked cookies is an enticing home, indeed! I think we all know that baking goodies will make your home smell yummy and you’ll get to eat (and share) delicious treats. This is simply a reminder that you can do this! When guests are coming over in an hour, but there’s a funky smell in your home, obviously first verify that the funky smell is not dangerous. If not dangerous (and just smelly), bake a fresh batch of cookies for when they arrive. That’ll get your home smelling wonderful, and you’ll be able to greet your guests properly. I also love this trick with freshly baked bread! There are so many household items that can become fragrant if you boil them in water and let them simmer. From coffee grounds to cinnamon sticks to vanilla extracts to orange peels. Try different combinations of things to get a scent you love! To simmer things for a nice scent, simply add 1-2 cups of water and boil some of these items together. Once boiled for 2 minutes, reduce the heat to a simmer. As long as you keep simmering, the scent will keep wafting around your home. Unfortunately, the scent only lasts as long as you keep the simmer so if you have a gas stove, this is not ideal. Ideally, use an electric burner (<< also super useful if you’re a fan of hot pot :D) or a slow cooker, if you have one. Warning though! Keep an eye on your stovetop and check it every so often. Do not let the water fully evaporate because burnt pot DOES NOT smell nice. As the water evaporates, you can add more water (no need to add more of the simmering items). Just make sure you keep the simmer. If you add too much cold water, return the pot of water to a boil before lowing it back down to a simmer. Did you know you can reuse your cinnamon stick? Once you’re done with your simmer, simply dry it out and use it for next time. When it’s no longer fragrant, compost it, but it should definitely last more than one session. Most conventional candles are made from paraffin wax (which are carcinogenic when burned) so don’t get those. Instead, go with 100% soy candles because it’s better for you and they burn longer. I don’t even light up half of my candles. In my last office, I frequently worked with a heavy smoker. He never smoked near me, but he smoked so often the smoke had permeated his clothes. I had a coconut milk mango soy candle by my desk that had a delicious scent. Obviously, I never lighted it up in a corporate office – I didn’t want to evacuate all 35 floors by setting off the fire alarm! But simply lifting the lid right before any meetings I had with him was sufficient to mask the smell emanating from his clothes. For small areas (i.e., right around your desk, or beside the toilet), you don’t even need to light up the candle. For ambiance and making a larger area smell nice, though – light it up. But keep it responsible with soy candles or beeswax candles! This mango-infused cedarwood scent sounds divine! And then, obviously, you need to seriously consider having your home smell like bear farts or deer farts. If you don’t want to simply mask the undesirable scents in your home, but you actually want to neutralize them, try simmering vinegar! As with the other simmering items, first, bring the vinegar to a boil, then lower to a simmer. Note: Don’t hang out around the simmering vinegar as you may experience some eye discomfort as the acid is being distributed into the air. Don’t keep houseplants too close enough. However, after you stop simmering, the effects dissipate, and there will be no leftover vinegar-scent. And no more of your undesirable scent! If you’re looking to naturally scent your home without essential oils, I hope you try a few of these natural air freshener ideas. They are all eco-friendly and (mostly) zero-waste. But most importantly, you don’t have to worry if something is toxic for a household with pets or small children. Well, perhaps keep an eye out if you’re simmering vinegar, but all the other methods are good to go. Do you use another great natural room freshener method? Have any additional tips on how to make home smell good, especially for those who want to avoid essential oils? Please share with us! I would especially love to try and experiment with new scents and other creative ways to create zero waste air fresheners!